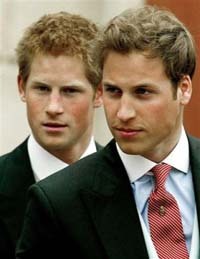 The sons of England's Princess Diana said in a television interview that they still think about their mother's death all the time. This August will mark the 10th anniversary of Diana's fatal car crash inside a Paris traffic tunnel. In an interview to be broadcast Monday on NBC, Princes William and Harry told "Today" show co-host Matt Lauer that their grieving process has been a long one, bereft of "peace and quiet" because of nonstop media attention. "There's not a day goes by I don't think, you know, that I don't think about it once in the day," said Prince William. Time also has not stopped Diana's sons from wondering - like much of the public - whether her death could have been avoided. "When people think about it, they think about her death. They think about, you know, how wrong it was. They think about, you know, whatever happened," Harry said. He continued: "You know, no one will ever know. And I'm sure people will always think about that the whole time." "Have you stopped wondering?" Lauer asked. "I'll never stop wondering about that," Harry said. In the interview, the princes say they still hope to have lives that are "as normal as possible," aside from their royal responsibilities. NBC plans to broadcast parts of the interview on both the "Today" show and "Dateline NBC."